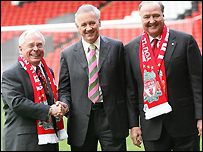 Liverpool chief executive Rick Parry has called on the club's co-owners to quickly resolve the Reds' future. On Friday, George Gillett revealed his partnership with fellow American Tom Hicks had become "unworkable". Parry is pleased that the admission brings the situation to a head but insists immediate action is needed. "If they're not able to co-exist then there needs to be a solution where one buys and one sells, or both sell," Parry told 5 Live's Sportsweek. "There aren't too many other possibilities but it's pretty clear that to carry on with the status quo is going to be extremely difficult." He continued: "There is no question that to succeed you need unity at the top, unity at the club, and everyone pulling in the same direction. "Without that, it is extremely difficult to progress and it is clear from George has said the unity is not there. "George has been pretty unequivocal in what he has said. You have to think he thought long and hard before coming out with the statement he made on Friday, it did not leave room for doubt." Dubai International Capital (DIC) recently failed in an attempt to buy into Liverpool, with Hicks refusing to do business unless he can retain a controlling share. Gillett appears to be open to offers and claimed DIC would be "responsible" owners. Whatever happens, Parry wants does not want the situation to drag on. "I think it brings it to a head - clearly for the good of the club," he added. "It's dragged on for long enough. The ideal would be to move to as speedy a resolution as possible." Former Liverpool captain Tommy Smith said the ownership saga had damaged the club's image. "It is a bit of an embarrassment because Liverpool don't hang their washing in public. "I think there was always going to be a problem with the two of them getting involved," Smith commented. But Peter Crouch, the club's England striker, told the BBC's Sportsweek programme that boardroom issues were not distracting for the team. "It is not great when you hear things about the club changing hands but as players we are paid to play. "When you are on the pitch you are not concerned about who is running it at the top end, you are concerned about the team in front of you," he said.